Pioneer VSX-930 review | What Hi-Fi? Pioneer triumphed in the upper price brackets last year – its £1400 SC-LX58 even scooped an Award – but its budget offering in the form of the VSX-924 was left in the dust of rivals from Yamaha and, even more so, Sony. With its successor, the VSX-930, Pioneer will no doubt hope to change that pecking order. However, to do so it has to shine as bright as Sony’s new, and brilliant, STR-DN860. A tall order, but if its spec sheet is anything to go by, it seems up to the challenge. 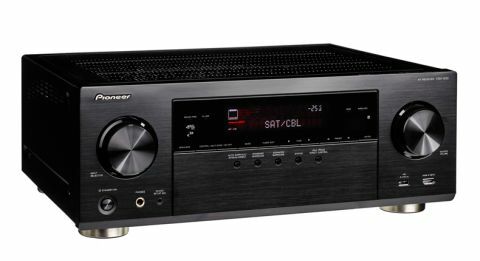 Sitting in the brand’s 2015 line-up between the 5.2 channel VSX-830 and the pricier VSX-1130, the 7.2 channel receiver boasts a shed-load of features – and one in particular stands out at this price. Like Onkyo, Pioneer hasn’t saved Dolby Atmos for its top-tier models; the VSX-930 can also work in a 5.2.2 configuration – the last ‘.2’ representing two Atmos channels to add overhead sound to your set-up. The chassis, available in black and silver, hasn’t changed much from last year so you still get the rock-solid build and smart frontage (though the panel is plastic, not aluminium like its big brother). All seven HDMI 2.0 inputs are compatible with 4K/60fps – the VSX-930 can also upscale a Full HD 1080p signal to suit 4K panels – and three are HDCP 2.2-certified so will work with Ultra HD Blu-ray discs and players when they roll in. A handful of analogue inputs join dual-subwoofer and single optical and coaxial outputs. One of the two HDMI outputs also gets the full 4K-supporting spec, while a second allows content to be streamed to a handshake with HTC’s compatible One-series smartphones. High-resolution goes beyond two channels, the VSX-930 flying the flag for multi-channel (up to 5.1) audio. There’s FLAC 24bit/96kHz support via USB, wireless and wired connection, while for stereo delivery, 24-bit/192kHz WAVs and FLACs, and DSD files up to 5.6mHz can be played via USB, or streamed. To say the Pioneer is well equipped is an understatement. And you can add user friendliness to its list of attributes too. A redesigned interface sees bigger tabs and bolder icons replacing the old listed menu format, making network and system settings easier to follow. The set-up process, tailored to take account of any Atmos-enabled speakers, is typically thorough – you have to endure a few minutes of harsh test tones, but we wouldn’t have it any other way. We are largely satisfied with the readings, which are always worth double-checking. Pioneer’s all-new Navi app can also guide you through set-up from scratch via your smartphone or tablet, and the physical remote has had some minor tweaks in the name of practicality. It’s still busier than we’d like, but layout changes and better markings make clusters of key buttons more visible. Time for some action. Plunge straight into the heart of Fast & Furious 6’s ludicrous shoot-out tunnel scene (in 7.1 DTS-HD) and the Pioneer doesn’t struggle to keep up with the breakneck sequence. There’s a sense of immediacy from the off as bullets dart around the big – though not the most spacious – soundfield. The performance is clear, precise and punchy with a good sense of cohesion and flow. It perseveres with cars racing across the front channels and keeps track of car parts as they fly off in different directions. Dynamics afforded to revving engines and the pounding score are enough to keep us wide-eyed and sitting up straight, while low-end clout gives explosions impact and authority. Skip forward to the tank scene and when the heavy machinery slams down onto the concrete, it does so with genuine thump. There’s stark clarity and directness across the frequencies, the leading edges of effects particularly crisp. We find the mid-to-high frequencies lack a little substance and insight compared with the rival Sony STR-DN860 (£400), and Vin Diesel’s gruff voice could do with more expression and, well, gruffness. But these shortfalls aren’t big enough to really worry us. As windscreens smash and windowed walls shatter there’s a pinch of hardness there that the Sony’s extra dose of refinement manages to keep a lid on. Musically, the Pioneer is a pleasing listen. Clear, dynamic and agile, it delivers with confidence and enthusiasm, whether we play Eminem’s edgy beats or Alicia Keys’ piano melodies. Grabbing Teenage Mutant Ninja Turtles from the shelf once again, we dive into its Dolby Atmos soundtrack. The sonic ceiling is hoisted up that much more and although the soundfield feels a little front-heavy without any rear Atmos-enabled speakers in play, there’s no mistaking the increased sense of height. Trajectories also have greater accuracy as the turtles fly and cars topple through the air. Sounds in the extra headspace move fluidly with the ‘regular’ channels, and where the soundfield feels a little closed-in on a normal (Atmos-stripped) configuration, we’re now satisfied with how open it sounds. It’s easy to look at Atmos all starry-eyed. Its sonic assets are clear, and with more Atmos discs being churned out, it’s becoming more tempting to buy into. The question here is how worthwhile it is at the budget end. After all, Atmos-enabled speakers are still pricey. Despite that, we’d still consider the VSX-930 a good foot in the door for those after a first taste of Atmos – even if, in our eyes, the Sony’s greater solidity, spaciousness and dynamic subtlety takes precedence over the surround technology at this price. The VSX-930 has the hallmarks of a great budget amp. It might not be quite as sonically competitive as the Sony, but it couples decent performance with improved usability, vast file support and more features than you can shake a stick at. If you’re after Atmos on a budget, then you certainly could do a lot worse.